Spaceship One has just reached the 60,000 metre mark. 212,000 ft, for those in the USA, about 6 times the altitude that Intercontinental jets fly at. On August 22, 1963, the X-15, also a manned aerospace craft, was launched from a B-52 bomber, reached 354,000 ft. That's over 40 years ago. So what's the big deal? The answer is that it's a relatively small firm that's doing it; They didn't just build the aerospacecraft, they built the launch platform as well; And they intend to fly just as high as the X-15, and do so twice within three weeks, using the same vehicle. Oh yes, it also carries passengers. I've done a little research on the history of air-launched rocket programs, spurred on by a regular reader, Mr G. (whose wife is Nana to Gnat Lileks). I even wrote a long article, but Blogger ate it a few months ago, and so I'll just summarise it here. I've restricted it to spacecraft carrying useful payloads that actually flew. Comprehensive list of winged amd air-launched vehicles is to be found at that unexcelled all-round set of resources for all things spacey, the Encyclopedia Astronautica. Proposals were considered for using the B-58 as a strategic missile launcher, and Lockheed built a 9.15 meter (30 foot) long solid fuel "air launched ballistic missile (ALBM)" derived from the company's X-17 test booster. The ALBM was test-launched four times in 1958 and 1959, with two successful launches. In the fourth and last launch, on 22 September 1959, the ALBM was launched into space to take a picture of an American Explorer satellite under "Project Snap Shot". This was a proof-of-concept test with applications for satellite inspection and anti-satellite interception, but that particular launch failed. The B-58 ALBM program was then abandoned, though the B-52-based "Skybolt" ALBM program persisted for a few more years. After studies in 1958 had shown that it was feasible to air-launch ballistic missiles from high-flying strategic bombers, the USAF issued a requirement in 1959 for a long-range ALBM (Air-Launched Ballistic Missile). In May 1959, Douglas was awarded a development contract for the WS (Weapons System) 138A missile, designated GAM-87 Skybolt. Douglas subsequently awarded development subcontracts to Nortronics (guidance system), Aerojet General (propulsion), and General Electric (reentry vehicle). The GAM-87 was intended for use by the B-52H Statofortress and the British Vulcan B.2. Full-scale development was approved in February 1960, and in January 1961, the first drop tests of unpowered Skybolts occurred. Powered and guided flight tests of XGAM-87A prototypes began in April 1962, but the first five tests were all failures. The first fully successful Skybolt flight occurred on 19 December 1962, but on that same day the whole program was cancelled and the production of the operational GAM-87A stopped. Although Skybolt certainly had its technical difficulties and was well behind schedule, the cancellation was also very much influenced by economical and political factors. The XGAM-87A was ballistic missile powered by a two-stage solid-fuel rocket motor and guided by a stellar-inertial navigation system. Each B-52H was to carry four GAM-87As, two each side-by-side on two underwing pylons. While on the pylon, the Skybolt was fitted with a tail cone to reduce aerodynamic drag. For launch, the missile was dropped from the pylon, the tail cone was ejected, and the first motor stage ignited. After first stage burnout, the Skybolt coasted for a while before the second stage ignited. 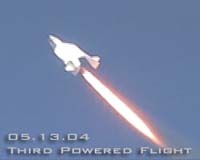 First stage control was by movable tail fins, while the second stage was equipped with a gimballed nozzle. Then of course, there's the only crewed aerospacecraft, the X-15. My own favourite, which alas never got beyond the 'Design Study' (or more accurately 'Wishful Thinking') stage, was a German project of 1985, the Saenger, seen below. It may have been completely impractical, but from an aesthetic viewpoint, nothing beats it. Photo credits to Astronautix.com, Space Daily, Sierra Foothills, and Gunter's Space Page.